Just a warning: if you get cats, they will get HUGE. I can’t believe Boba used to fit in one hand. Now he fits perfectly on my entire desk, as you can see. They turn into giant, wild beasts so fast. 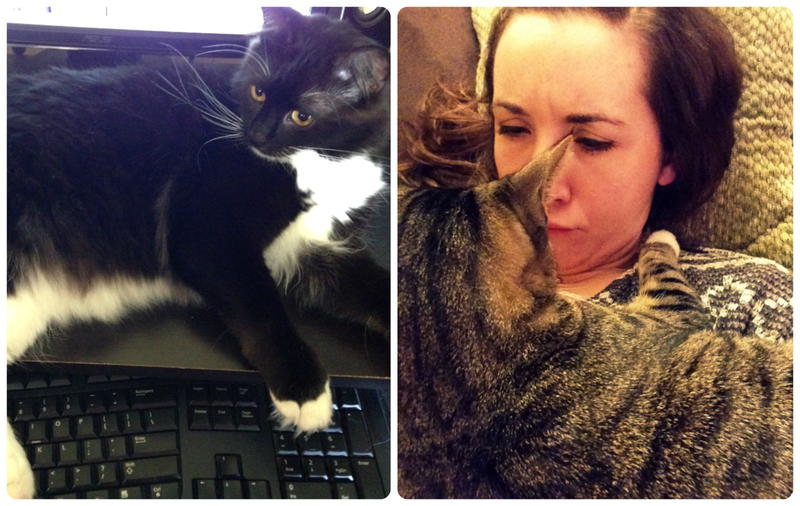 They still love cuddles, though. Awww look how cuddly they are though! So adorable! They can be pretty sweet when they try. Although, you have to watch out cause Luna farts like a manly man. LOL yes this is exactly what happens. I'm trying to blog and he's sitting in front of my screen. “Have you blogged about me yet? ?” is what I imagine him thinking. Cats really seem HUGE when you have a kitten too. We have an 8 year old cat, and she seems huge & feels huge now that we have a 3 month old kitten! Awww this is adorable. Cats are so precious. When we first got our kittens, we went back to see my mom and I saw my cat I had not seen in a while. I didn't realize how HUGE he was, lol. You get used to their size until you see a baby kitty. They make my day every day! Well, Boba's the puffy one but Luna's probably the fatter one, lol. Definitely thought it was gonna be the opposite way around.